This Fall, we have found many uses for candy corn (besides just eating the sweet treat!) We have used candy corn in some of our holiday crafts for kids, simple dessert recipes, and learning activities such as our Count and Add Candy Corn Math Mats. 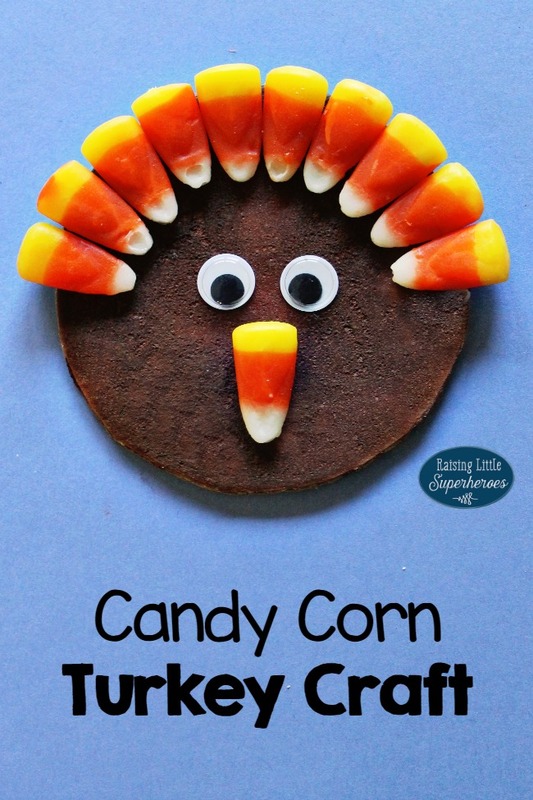 Since Thanksgiving is just a few weeks away, we used our favorite candy to create a Candy Corn Turkey Craft today. Draw a circle one the cardboard or heavy paper (such as card stock) that is about 3 inches in diameter. We traced one of our drinking glasses. Cut out the circle. Your child may need help cutting the circle especially if you are using cardboard. Paint the circle with the brown puffy paint. To make your own puffy paint, mix 2 tablespoons of shaving cream and 2 tablespoons of white glue. Add 1/2 of a tablespoon of brown tempra paint and mix the ingredients together. After the paint dries, glue the candy corn around the edge of half of the circle to create the turkey’s feathers. Glue on the googly eyes in the center of the circle. Glue one piece of candy corn under the googly eyes for the turkey’s beak. If you are creating this Candy Corn Turkey Craft with young children, you may want to have a few extra pieces of candy corn for them to snack on so they aren’t tempted to eat the ones with glue. Awe! Very cool. What a great way to utilize that leftover candycorn candy!Thanks for sharing on Toddler Fun Friday. Ali Gilbert recently posted…Donut Appreciation FREE Printable Tags!